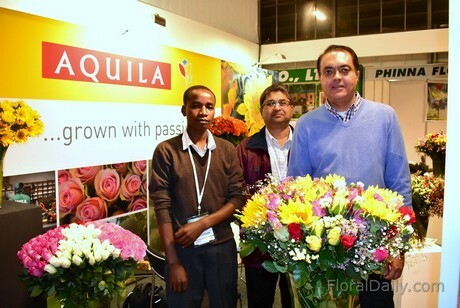 Because of the high labor costs and low availability of workers in Europe, Kenyan flower grower Aquila decided to go into bouquets. This farm, that primarily grows roses, started growing summer flowers two years ago and expanded their assortment over the last year. This enables them to make the required bouquets on source. Aquila has been growing roses on 30 ha in Naivasha for several years now, and two years ago, they expanded into summer flowers. There are several reasons why they went into summer flowers, explains owner Ranjit Singh Amrit. "First of all, expanding in roses is expensive as we need to build another greenhouse. Also, as we have an earthquake line running through the property, building a greenhouse on it is not such a wise choice. Secondly, we trialed several summer flowers first and the reactions were positive. Finally, we saw that the demand for mono lines stabilized and the demand for bouquets increased, and particularly for the bouquets made on source." The demand for bouquets made on source are increasing because of the high labor costs and low availability of workers in Europe, explains Amrit. "As a result, as our labor costs are lower, they are asking for bouquets made on source." Aquila grows their summer flowers outdoors and their assortment consists of seven varieties, grown on 4 ha. Their spray carnations take the most space and are grown on 3 ha. The remaining acreage is used for their sunflower, gypsophila, statice, solidago, lisianthus and rosemary. Aquila mostly deals with retailers, and as they more often require Fair Trade grown flowers, the Fair Trade certification for all their flowers is a big advantage for them. "We can make Fair Trade bouquets and this is valued by the retailers."